FACT’s adoption process is straight-forward. There are two ways to complete an application. Print Out An Adoption Application, complete and return to us by mail prior to contacting us for an appointment. During our meeting, we offer care tips, health information, and discuss food and litter needs. Depending on your level of ferret knowledge, the interview will take 30-45 minutes. If all goes well, you can plan on taking your new friend home that day! Part of our service is to determine which animal(s) currently in the shelter will best suit the adopter’s home, family, lifestyle, and other animals. While there is usually a variety of animals, if your family has specific needs, the right ferret may not be currently available. FACT retains the right to refuse adoption to anyone for any reason. We cannot adopt to those under the age of 18; a parent or guardian should execute the adoption contract. It is expected anyone over 18 living with parent(s) or other parties obtain approval before adoption. Anyone living in a rented apartment or home should be ready to provide proof of acceptance of pet ferret(s) prior to adoption. If you are seeking a companion for an existing ferret, you may bring him/her along at the discretion of the shelter director. 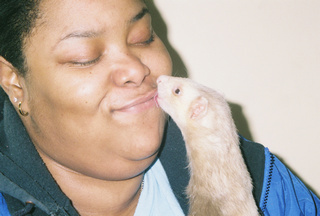 When there are many ferrets in the shelter, it can be overwhelming for the visitor. Your ferret will rarely “choose” their new friend; you will have to make that determination. Please understand ferrets may transmit intestinal viruses to each other and there is no way to determine susceptibility in advance. We will advise and offer care info to the best of our ability if your ferret becomes ill. By voluntarily bringing your ferret to the shelter, you agree to hold the shelter harmless for any illness or medical expenses. There is a full refund policy within 2 weeks and an even exchange option within 1 month. We remain available to give advice, as needed, to help the adopted ferret settle in comfortably. Under the terms of the adoption contract, if for any reason the adopter must surrender the ferret, it must be returned to FACT. No transfer or sale of adopted animals is allowed. FACT retains permanent ownership of every animal and may legally reclaim the animal if we become aware of inhumane treatment. Please note: Many ferrets like to nip toes! It’s unwise to wear sandals or open-toed shoes to visit a ferret shelter. By voluntary visiting the FACT shelter, you agree to accept the risk of a nip or scratch and hold the shelter, staff, and landlord harmless for any injury.